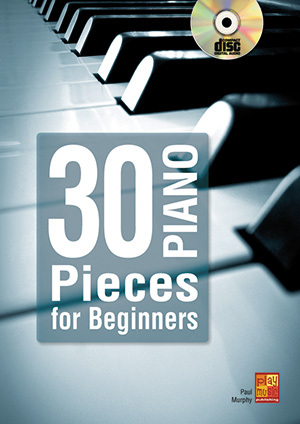 30 Piano Pieces for Beginners (PIANO, Coursebooks, Paul Murphy). The 30 pieces contained within this tutorial are aimed exclusively at piano beginners. All pieces are easy to play and will enable you to rapidly gain substantial experience in piano playing and, since they are adapted versions of real musical pieces, you will at no time lose your pleasure of playing. In order not to overwhelm you, the level of difficulty of the pieces to be performed increases progressively, allowing you to work in a fluent and coherent manner. The piano pieces put together in this tutorial will also allow you to discover musical styles which are totally different from one another, forming a large panorama of contemporary and classic music. You will get a taste of popular music, jazz, ragtime, blues and rock. So you can rest assured, there’s something for everyone in here(!) The CD attached to the book will make your study even more enjoyable. Every musical piece appears twice: the first time for demonstration purposes (with the piano) and the second in the form of a backing track (without the piano), in order to give you the opportunity to play the piano and enjoy the accompaniment of other musicians.